If I am only requesting reimbursement, does my home have to be inspected? Yes, the Program will verify the work done previously passes all Program inspections and environmental clearances. Does the contractor and design professional I choose have to meet any Program requirements? Contractors need to be licensed to do work in your community and meet all other municipality requirements to perform work on the property and not be on a debarment list. Designers need to have all required New York State Licenses and certifications. Can I be my own GC (General Contractor)? For repairs costing less than $10,000, Applicants are not required to use a GC. 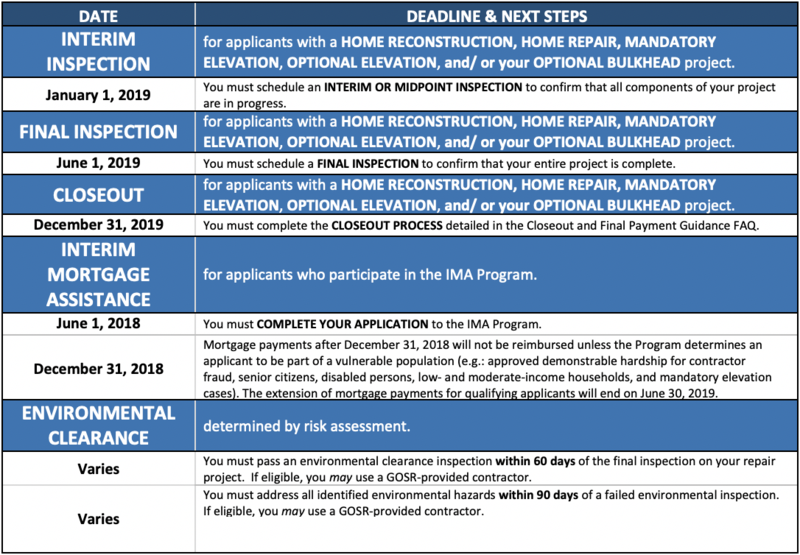 For repairs at or exceeding $10,000, an Applicant would have to meet the same minimum standards for general contractors in order to act as his/her own GC. Please contact your local building official to confirm requirements. What should I do if I do not agree with the Program’s determination of my eligibility or the amount of my award? The first thing you should do is ask for an explanation from your Customer Representative or Call Center Representative, but if you think the decision was made in error you should ask for a Clarification and provide supporting documentation, which will prompt a review of your case. After the Clarification is completed you will receive a Clarification Determination, after which you may request an Appeal, if you disagree. You can only appeal a resolved (completed) clarification, for which the Program has issued a Clarification Determination Letter; in your appeal form you should reference the completed clarification that you are appealing. You should clearly explain the reason for your appeal on the form and submit any additional material you have that supports your claim. You must obtain an appeals form from your Customer Representative and you may: Email it to [email protected] or, contact your Customer Representative to email it on your behalf.